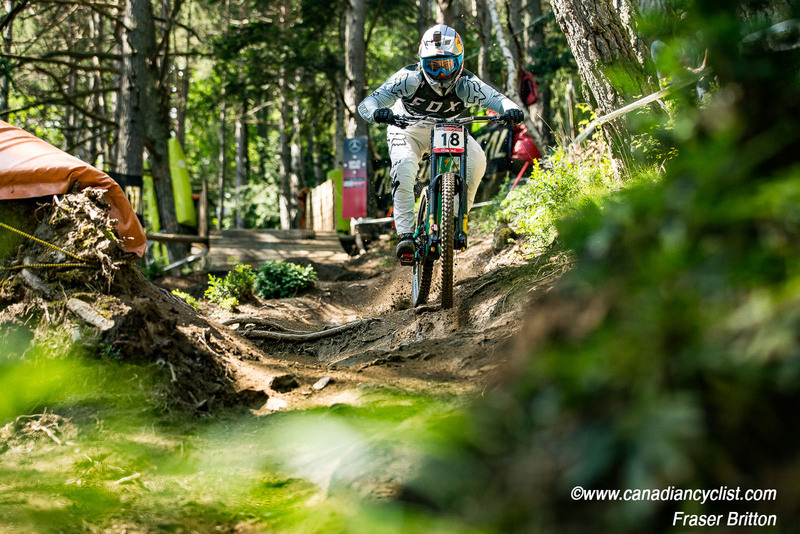 The UCI Mountain Bike World Cup moved to Vallnord, Andorra, for Round 5 of the Downhill series. Both the men's and women's World Cup leaders hung onto their jerseys, but each had to settle for second place as the battle for the overall titles tightens up. Canada's Finn Iles had his first Elite World Cup podium, finishing fifth after spending time in the Hot Seat. Mark Wallace (Canyon Factory) also had a strong ride, finishing 18th, while Henry Fitzgerald (Norco Factory) was 37th and Magnus Manson was 39th. In Elite women, world champion Miranda Miller was 12th, while Kendall McLean was ninth and Ben Wallace 11th in Junior men. Vallnord takes the riders to altitude, with the start at over 2000 metres, which certainly can play a factor in physical extertion. Vallnord is also the steepest track on the circuit, and the bumpy, twisty descent saw many riders put out of contention after mistakes. Eleonora Farina of Italy was the first to go under 5:05, but her time was clearly not fast enough, after World Cup leader Rachel Atherton (Trek Factory) had set an incredible qualifying standard of 4:52, a full 13 seconds faster than second fastest qualifier Tracey Hannah (Polygon UR). 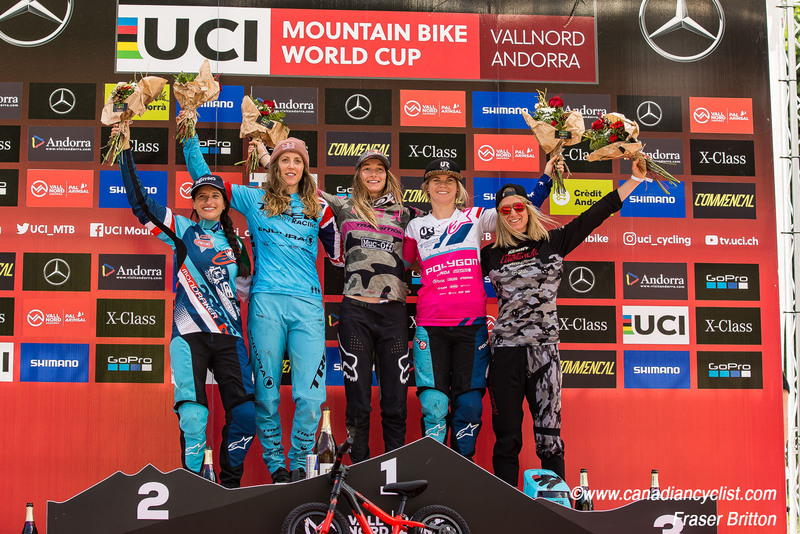 Former World Cup leader Myriam Nicole (Commencal/Vallnord) missed her second World Cup after a crash in training at the previous weekend's World Cup kept her off the bike. Tahnee Seagrave (Transition Bikes MUC-Off) proved that she was a lot faster than her third place qualifying, when she beat Atherton's qualifying time by three seconds to record the first sub-4:50 time. Hannah, second from last, was 8.7 seconds slower than Seagrave, leaving only Atherton to race. Atheron started out much faster than Seagrave, with a four second lead after the second split. Unfortunately for her, a badly hit bump kicked her off the course, and while she was able to rejoin the track at the same spot, the damage was done. Remarkably, she still managed second, 4.829 seconds back, as Seagrave took her third win of the season. "I knew that Rachel was going to be stronger than me after qualies," said Seagrave. "My qualifying run wasn't great but it was solid, so I knew I had some work to do. I knew it was going to be won on the bottom section so I had to be smart and not push too hard. I've never done well in Andorra, so I'm just over the moon." Despite finishing second, Atherton continues to lead the standings with 986 points, but Seagrave pulls to within 80 points with two races remaining. Hannah moves up to third at 740 points, jumping ahead of Nicole. Miller remains in 16th place. 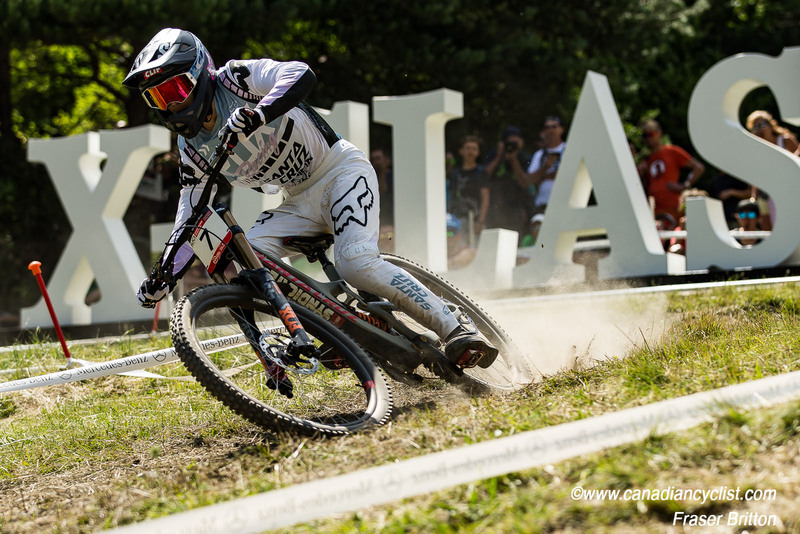 The men's race was missing perennial favourite Aaron Gwin (The YT Mob), who at the Val di Sole last weekend reinjured the thumb he had originally injured at Fort William. 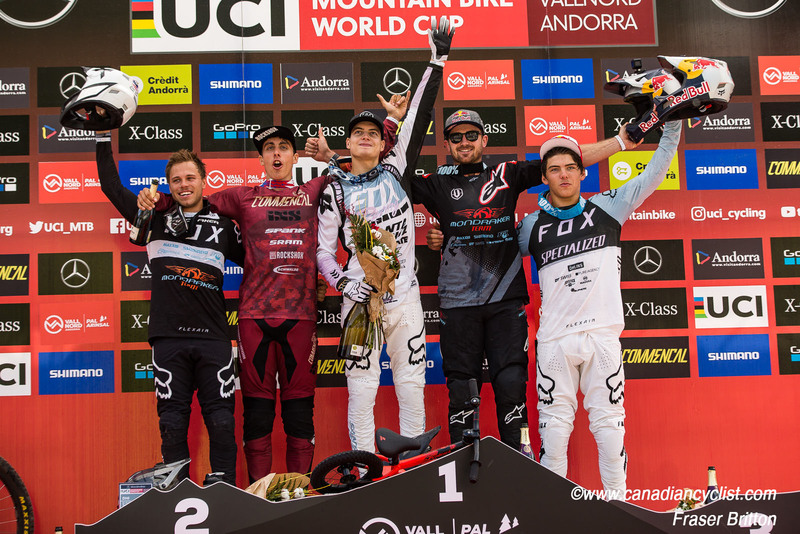 World Cup leader Amaury Pierron (Commencal/Vallnord) came into the race with three straight victories, and was looking for an unprecedented fourth. Angel Alonso (The YT Mob) set the first sub-4:14 time, halfway through the field, which held up until former Junior world champion Finn Iles became the first to go under 4:10, with a 4:08.634, also the first to beat top qualifier Luca Shaw's (Santa Cruz Syndicate) time of 4:09. "Sitting in the Hot Seat is more nerve-wracking then being in the start gate or riding as you watch rider after rider come down," said Iles. "So, I was sitting there shaking and fidgeting. Between the second and third split there are a few critical corners where you have to carry good speed, and I think I did that section well. I'm pretty happy with my run, but I think I braked a bit too much in the last two corners." Iles was still leading as the top ten qualifiers started to come down, but at eight to go, Loris Vergier (Santa Cruz Syndicate) put together a blazing fast run nearly five seconds faster at 4:04.005, which would prove to be the winning ride, and the young French rider's first World Cup victory. Pierron, the second fastest qualifier, got closest to Vergier, but was still 1.333 seconds back, with Brook MacDonald (MS Mondraker) taking third. "It's just ... I don't know...," said Vergier. "I cried a lot ... I've tried for ten years for this. Hard work pays off. It was drier and slipperier than before, so you had to be smooth on your lines. You just have to have luck and put everything together." Pierron still holds a commanding lead in the overall race with 933 points, while Vergier jumps from seventh to second, 280 points behind his countryman. 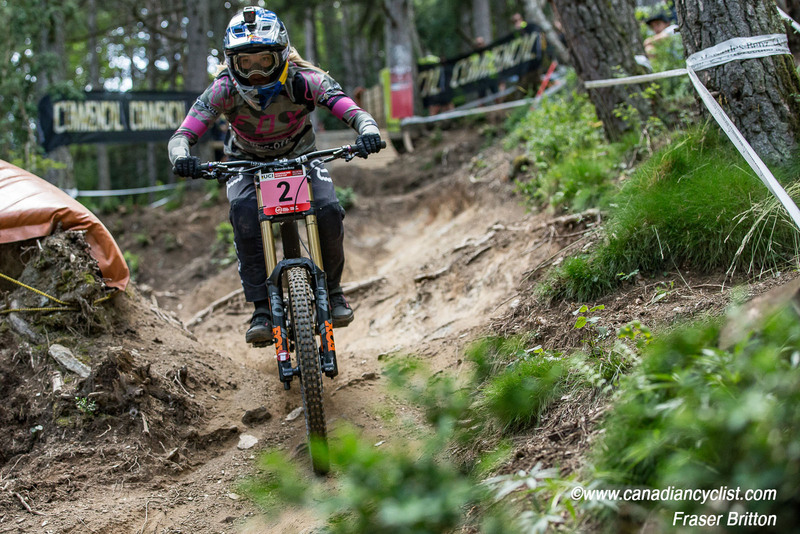 Laurie Greenland (MS Mondraker), who finished fourth, drops from second to third, a further seven points back.